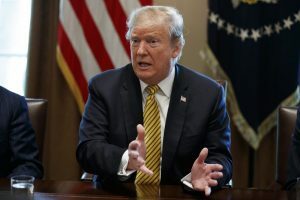 WASHINGTON — President Trump is well on his way to raising the $1 billion his campaign believes it will take for him to win another term in the White House, building a fundraising machine that will prove difficult for Democrats to match. Trump’s bring-it-on fundraising approach – which will be on display during a stop in Los Angeles on Friday – is a far cry from his stance in 2015, when the billionaire reality TV star and developer launched his first bid for president promising to use his own money to finance his campaign. It’s also an indication of how he has made his political apparatus more professional for Round 2. “Whoever the Democratic nominee is, they’ll be depleted, and they’ll have to start from zero – well under zero, the DNC has a debt,” said Michael Glassner, the Trump campaign’s chief operating officer. He called Trump’s decision to keep the campaign in operation during his first two years in office the “new model” for future presidents. Trump is traveling to Los Angeles on Friday to raise money for his campaign and the Republican National Committee. Dinner tickets run $15,000 – or $50,000 for a photo with the president and $150,000 to participate in a roundtable with the president. The RNC says 170 people are expected to attend. Trump’s fundraising is divided between two entities: Trump Victory, the joint account used for high-dollar gifts, and Trump Make America Great Again Committee, the low-dollar digital fundraising operation known internally as “T-Magic.” The campaign is set to launch a traditional “bundling” program – which it lacked in 2016 – in the coming weeks. Bundlers are mid-tier donors who bring in contributions from their associates.